To make the cookie base, preheat oven to 375° F and grease 9 x 13-inch jelly-roll pan.Combine flour, baking soda and salt in small bowl. Beat butter, granulated sugar, brown sugar and vanilla extract in large mixer bowl until creamy. Add eggs, one at a time, beating well after each addition. Gradually beat in flour mixture. Stir in chocolate morsels. Spread half of cookie dough into prepared pan and bake for 8 to 10 minutes. Remove pan from oven and set aside and begin caramel. To make the caramel, in a double boiler (or a heatproof bowl set over a saucepan of boiling water) melt caramels with ½ cup evaporated milk. When melted and combined, add ½ cup melted peanut butter and pour over cookie base. Sprinkle chocolate chips as evenly as you can over the caramel. Turn out remaining cookie dough on work surface. Use your hands to press it into a large square a little smaller than the pan. 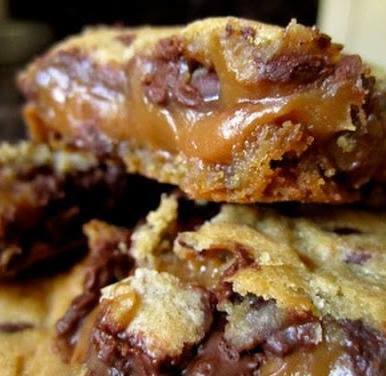 Use a spatula to remove it from the surface, then set it on top of the caramel and chocolate chips. Bake for 15 to 20 minutes or until golden brown and edges are set. Cool in pan on wire rack. Makes 2 dozen bars.